The SBStickyNotes Cydia tweak will add notes from the Notes.app to your SpringBoard in the form of an icon that upon clicking on will open a notes widget. In case you are wondering, notes can be added from the Notes.app to your SpringBoard with a new button that will appear in the Notes.app upon installing the Cydia tweak. If you are interested in the SBStickyNotes tweak you can find it through the BigBoss repo for free. Do you want more space to place apps on your SpringBoard (homescreen)? Then look no further than the FivelRows Cydia tweak! FivelRows will add an extra row to your SpringBoard bringing you to 5 rows total. 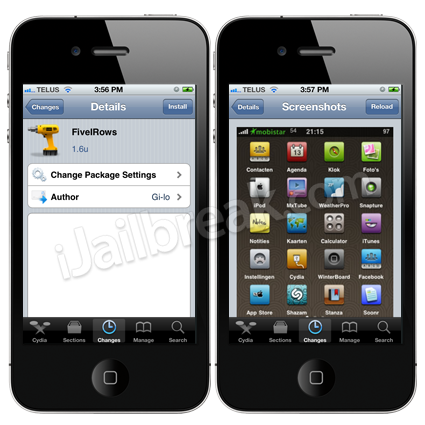 This allows you to place more apps per page and also easily set-up themes requiring a 5 row SpringBoard layout. If you are interested in the tweak you can find it through the ZodTTD & MacCiti repo for free. Have you found a great App Store application and would like an easy way to tweet about it to your friends with a link to the application’s page on the App Store? With the AppTweeter Cydia tweak you can easily tweet about an app’s information and the app’s linkURL from AppStore’s “Tell a Friend” button. 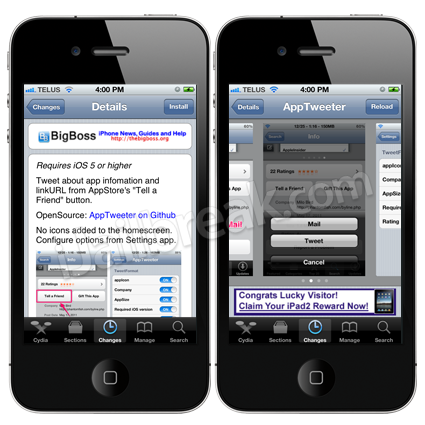 If you are interested in AppTweeter you can find it through the BigBoss repo for free. 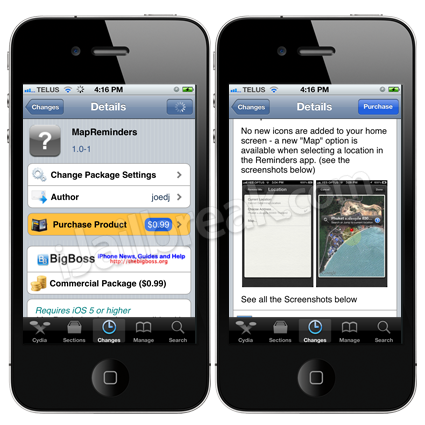 The MapReminders Cydia tweak will improve the location reminder functionality in the stock iOS 5 Reminders.app by adding a Map option to the list of ways you can help remind yourself to do something. Upon enabling this map option you will be reminded to do something from a map perspective. If you are interested in the MapReminders tweak you can find it through the BigBoss repo for $0.99. What do you think about these Cydia tweaks? Let us know below! very cool tweak! better than reminders!! you can have all the time in springboard not waiting for an alarm! !